If you have not seen this year’s craze of overzealous “Elf on the Shelf” mommies, you must google it to see what I am talking about. For those who feel in the dark on the topic, Elf on the Shelf is a combination children’s book and doll. The story explains how Santa keeps an eye on who is being naughty or nice via his helper elves, ie: the dolls that are packaged with the books. The story is that the elf watches over the kids during the day, then flies back to the North Pole at night to report back to Santa. When the elf returns from the North Pole each day, he perches himself somewhere different in the house. And so begins the daily game of hide and seek to see where the elf has ended up. The kids can give their elf doll a special name; ours has been named Chris. This year it seems that some mommies have gotten extra creative with their elves. Children are waking up to find that the elves have gotten into all kinds of crazy situations overnight. For a few really great examples of what I mean, look here. Last year my elf just moved around from the bookcase to the counter to the entertainment center but this year the bar has been raised. This year, my kids expect Chris to be doing cannonballs into the kitchen sink. Chris has humored them with a few silly escapades. 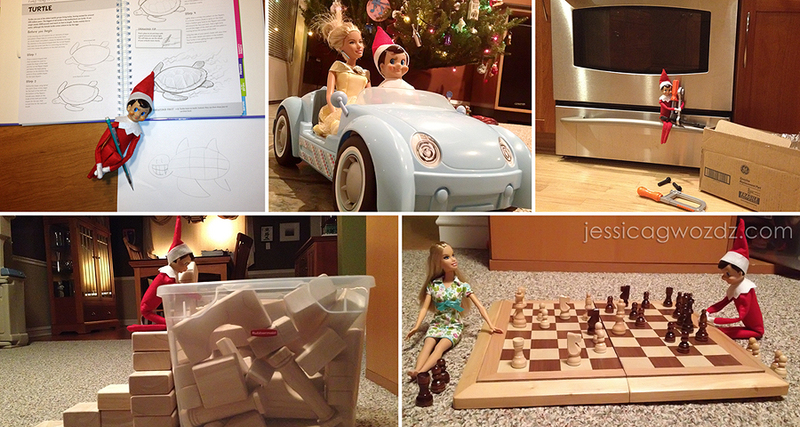 He has gotten into their art books and blocks, taken Barbie out for a spin around the family room, helped MacGyver install a new igniter in the oven, and had a midnight game of chess. In the spirit of religious diversity within our family and friends, Chris is not exclusively just a Christmas elf. It seemed only fitting that Chris would be hanging out with the menorah on the first night of Hanukkah. May whatever lights you light this season shine bright. Peace to all! 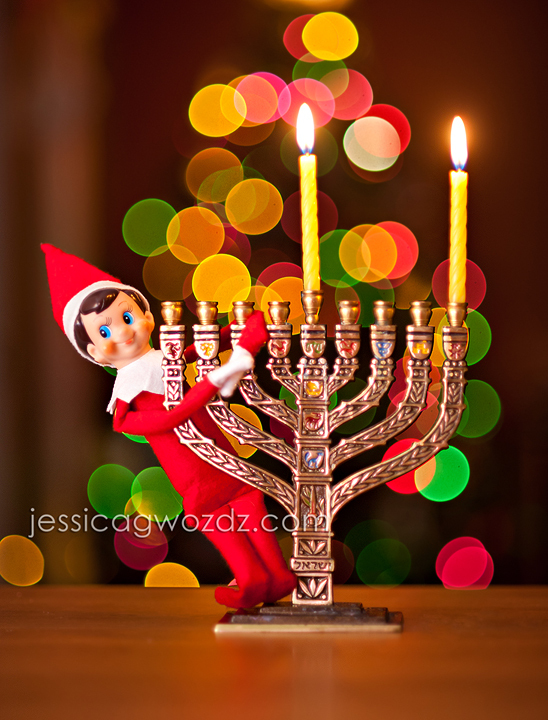 Sabrina - Oh wow love the image of your elf with the menorah with the lights in the background! And looks like he’s a fun-loving elf! Ours is less adventurous (he sits in the same spot for a few days because we forget about him). Although I did catch my 4yo confessing and apologizing to him for breaking something yesterday! Love the magic! Melissa M. - Love the first image! What a fun elf you have.